Day 3 is no disappointment. 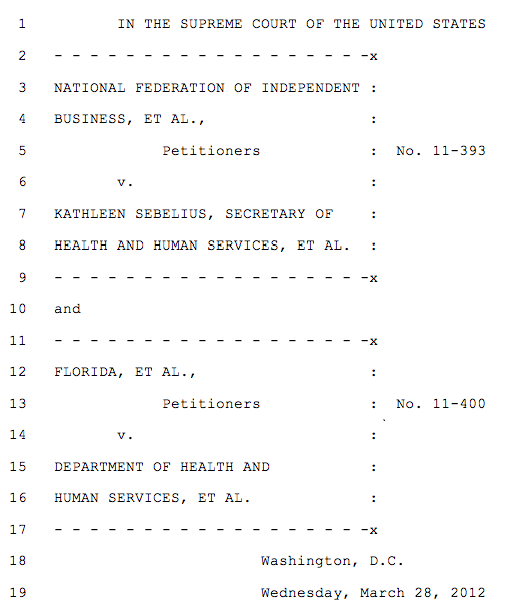 The core argument by Florida AG Clement is that if the individual mandate is ruled unconstitutional, the entire Patient Protection and Affordable Care Act, absent the severability clause, must fall. Judging from the robust engagement of AG Clement, including an interesting line of questioning from Justice Kagan, (peppered with periodic audience laughter), his argument was enjoined by a somewhat skeptical Court. P.S. It wasn’t a ‘cakewalk’ for Deputy SG Kneedler either. The Court is engaged on both sides of the arguments presented. A must listen event! For the audio proceedings of Day 3, click here. The transcript is accessible here. [Editor’s Note: Later today, the Court hears the arguments over states’ rights and the expansion of Medicaid under the Act].